Facebook ads linked to a Russian effort to disrupt the American political process are displayed at a House Intelligence Committee hearing on Capitol Hill in Washington, Nov. 1, 2017. The United States is threatening automatic sanctions to deter Russia and any other current or future adversary from interfering in the country’s elections. President Donald Trump declared a national emergency Wednesday, signing an executive order that mandates a range of economic sanctions and other penalties against any person, group or country assessed to have meddled with the upcoming midterm elections November 6. The order comes eight weeks before voters go to the polls and covers attacks on America’s election infrastructure, such as voting machines and voter databases, cyber attacks against candidates or political organizations, and disinformation campaigns. It also comes as the White House is trying to take a tougher line against Moscow after Trump publicly accepted Russian President Vladimir Putin’s denials of his country’s involvement in any interference in the 2016 U.S. presidential elections, contrary to the findings of the U.S. intelligence community. 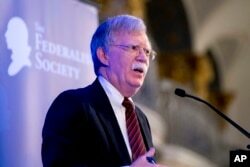 FILE - National Security Adviser John Bolton speaks at a Federalist Society luncheon at the Mayflower Hotel in Washington, Sept. 10, 2018. “It’s a further effort, among several that the administration has made, to protect the United States against foreign interference in our elections and really our political process more broadly,” National Security Adviser John Bolton said Wednesday while briefing reporters. “We felt it was important to demonstrate the president has taken command of this issue, that it’s something he cares deeply about,” Bolton added. There have been ongoing concerns about attacks or disinformation campaigns, fueled in part by Trump’s own attacks against the ongoing special counsel investigation into Russia’s activities and into possible collusion with Trump’s own campaign staff. 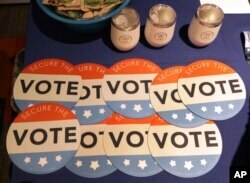 Computer mouse pads with Secure the Vote logo are seen on a vendor's table at a convention of state secretaries of state, July 14, 2018, in Philadelphia. The new executive order gives U.S. intelligence agencies 45 days after an election to report any efforts to meddle with the outcome. The U.S. attorney general and the Department of Homeland Security will then have 45 days to review those findings. If they agree with the assessment, it would trigger automatic sanctions. Those sanctions could include blocking access to property and interests, restricting access to the U.S. financial system, prohibiting investment in companies found to be involved, and even prohibiting individuals from entering the United States. Additionally, the order authorizes the State Department and the Treasury Department to add on additional sanctions, if deemed necessary. “I applaud the attempt to make it harder to evade, to let something fall away and not be countered,” Michele Markoff, the State Department’s Deputy Coordinator for Cyber, said during a panel discussion in Washington Wednesday. 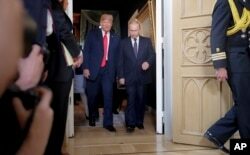 FILE - U.S. President Donald Trump, left, and Russian President Vladimir Putin arrive for a one-on-one-meeting at the Presidential Palace in Helsinki, Finland, July 16, 2018. “I think it’s going to be good,” said Sean Kanuck, a former intelligence officer for cyber issues, now with the International Institute for Strategic Studies. Still, Kanuck said the executive order alone is likely not enough. Other cyber analysts are even less optimistic. “The July Helsinki meeting between Trump and Putin has a visual effect that is searing and long lasting,” said Laura Galante, a senior fellow at the Atlantic Council who has previously worked with the U.S. government. “Words, and those words in Helsinki, probably speak louder than executive action,” she said. FILE - Sen. Mark Warner, D-Va., speaks with reporters on Capitol Hill in Washington, Sept. 27, 2017. Key lawmakers are likewise cautious. 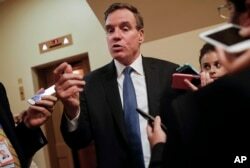 “An executive order that inevitably leaves the president broad discretion to decide whether to impose tough sanctions against those who attack our democracy is insufficient,” Mark Warner, the ranking Democratic member of the Senate Intelligence Committee, said in a statement. “If we are going to actually deter Russia and others from interfering in our elections in the future, we need to spell out strong, clear consequences, without ambiguity,” Warner added. “Today’s announcement by the administration recognizes the threat, but does not go far enough to address it,” Republican Senator Marco Rubio and Democratic Senator Chris Van Hollen said in a joint statement Wednesday. But Senate Intelligence Committee Chairman Republican Richard Burr expressed hope the new executive order will “send a clear message” to Russia, Iran and others. FILE - U.S. Director of National Intelligence Dan Coats speaks during a press briefing at the White House, Aug. 2, 2018. Trump administration officials said Wednesday they have not ruled out working with lawmakers on additional measures, but said they did not want to have to wait for legislation to be approved before having a chance to act. And while some of the proposed legislation focuses on Russia, the officials said it was important to take a broader view. 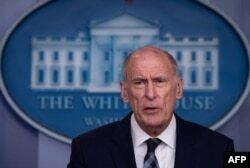 “We have seen signs of not just Russia, but from China, of capabilities, potentially from Iran, and even North Korea,” U.S. Director of National Intelligence Dan Coats told reporters Wednesday.